NEW YORK (AP) — Josh McCown might be in for at least one more start for the New York Jets. The 39-year-old quarterback banged his hand on a helmet, causing a cut during New York’s 27-13 loss to New England on Sunday. He had a heavy wrap on his hand as he left the locker room, but it isn’t expected to keep him out of practice Wednesday. McCown made his second straight start and went 26 of 45 for 276 yards and a touchdown with one interception in place of rookie Sam Darnold, who has been sidelined with a foot strain. The injury could keep the No. 3 overall pick sidelined for another week, but coach Todd Bowles said it’s too early to tell whether Darnold might skip another practice. Darnold has not played or participated in team drills since injuring his foot at Miami on Nov. 4. Davis Webb has served as McCown’s backup in New York’s past two games. The Jets, who have lost five straight, play at Tennessee on Sunday. If Darnold sits out against the Titans, there’s hope he might be able to return for New York’s road game at Buffalo on Dec. 9. Darnold struggled in the three games before he was injured with just two touchdown passes and seven interceptions in that span. Despite missing the past two games, Darnold still leads the NFL with 14 INTs. Bowles reiterated that the time on the field, including the struggles, will be good for Darnold moving forward into next season. Darnold very much remains the focus of the Jets for the future despite the overwhelming uncertainty surrounding the franchise. With the Jets struggling as the season hits the home stretch, it appears unlikely Bowles will return next year. The defense, his bread and butter, has failed to get a takeaway in a franchise-record five straight games. 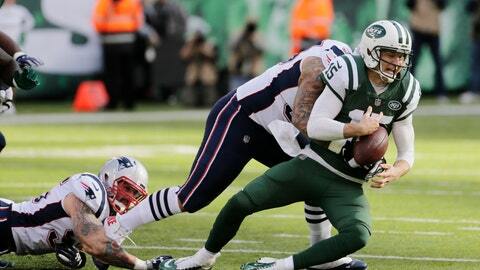 New York allowed 498 yards against Tom Brady and the Patriots , including a whopping 215 on the ground. The Jets have also been susceptible to giving up big plays with 28 of 20 or more yards during their five-game skid. The offense has also been a major issue, with the Jets failing to put up more than 17 points in any of their losses during that span. They have scored a total of 56 points, and that comes after New York outscored Indianapolis 42-34 in its most recent victory on Oct. 14. The Jets had 338 yards against the Patriots, but oddly ran the ball just 15 times for 74 yards while McCown threw 45 passes. “I thought he called a good game,” Bowles said of offensive coordinator Jeremy Bates. Bowles added that he has no plans to take any of the play-calling duties from Bates, whose offense ranks 29th overall in the NFL. Other than New York’s 41-10 loss to Buffalo two weeks ago, Bowles said the common thread during the skid has been an inability to close out opponents. One player being out of place in a crucial spot, not communicating and a simple lack of execution have all been culprits. One thing that has remained consistent throughout all the losing has been Bowles’ message to the team.